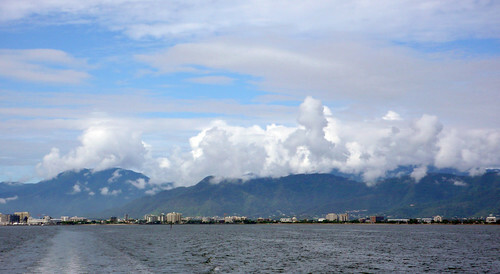 Cairns is on the northeastern side of Australia, in Queensland (apparently the only state where people actually say “crikey,” though we never heard any Aussies use this phrase). Cairns the city isn’t much to write home about, but it acts as a launching pad for the Great Barrier Reef. 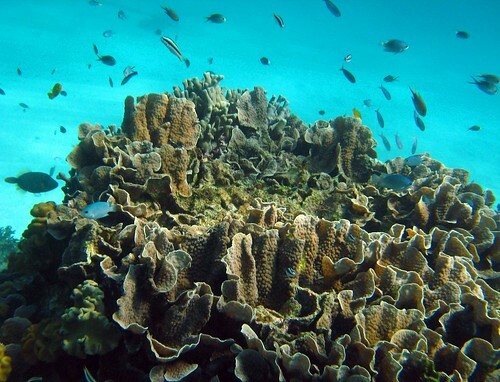 The GBR is unusual, first, for its size (huge), and secondly, for the fact that it exists so far away from the coast (usually, reef systems develop fairly close to the shore). 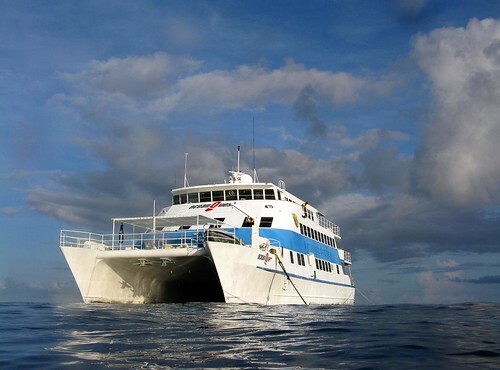 As a result, to get the best diving experience in the GBR, you must stay on a liveaboard boat. 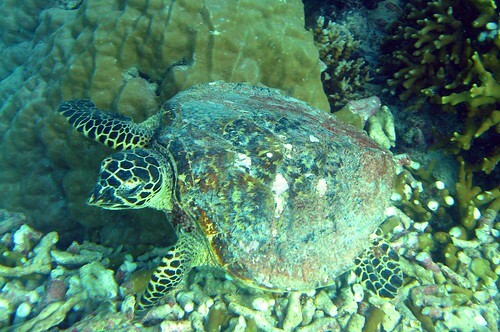 You can do a day boat out to the reef, but you will spend most of your time in transit (it takes an hour on a motorboat just to get out to the reef) instead of doing what you really want to do, which is diving. We did a 3 day/2 night excursion with Deep Sea Divers Den, one of the larger GBR touring operations (the other is ProDive). It is a large boat, with room for 48 people, but the boat was not at capacity since this is the low season in Cairns due to tropical storming (Aussies call it “the wet,” and indeed, it apparently stormed really hard the day before we flew into Cairns, as the surrounding plains were completely flooded). We had tried for a smaller boat—the Santa Maria is smaller sailing vessels that maxes out at 10 people per trip—but their leave dates did not work with our schedule. 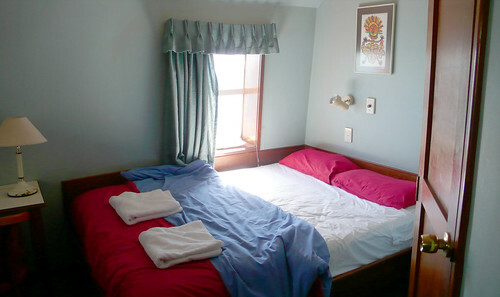 Nevertheless, DSDD is a great deal: a really nice double room, all food, and all gear for 12 dives costs AUD$560 (approx. US$420) per person. They do try to upsell you on a few things (guided and deep dives, a nicer flashlight for the night dives, etc. ), which is annoying but I guess to be expected. The common areas on the boat are also really large and comfortable, so we never felt crowded or claustrophobic. Our double room on the OceanQuest II. Needless to say, we were pretty happy to be transferred over to the OceanQuest II, where things are much calmer, more spacious, and less..barfy. OceanQuest II, take me away! OK, on to the diving. When we tell people that we dove the GBR, the first thing they ask is, “Is the reef really dying?” And the answer is, well, yes, parts of it are. But other parts of it are still really beautiful and pristine. On the OceanQuest II, we moved dive locations twice a day, but all locations seemed to be clustered around the same area. 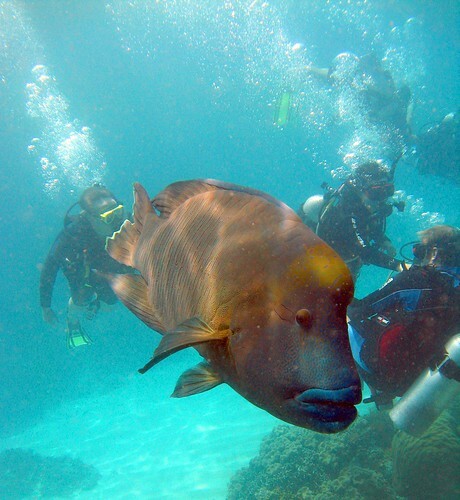 We are not sure if maybe Queensland makes the large boats stick to a certain part of the reef in order to minimize damage, or maybe divers are only allowed in certain areas. In any case, it seems that you move very short distances from one cove to the next when you dive with these liveaboard operations. 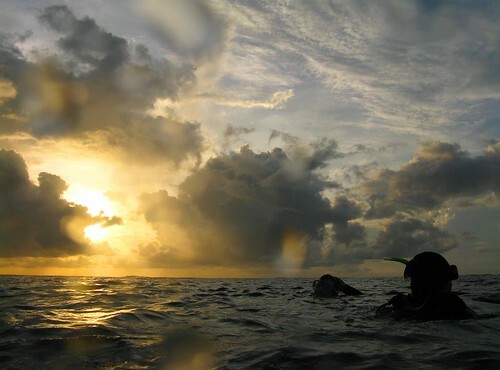 I don’t think we had the best dive conditions when we were there. The first day was pretty bad because the storm had stirred up a lot of stuff and visibility was pretty poor. But by the second day the visibility was a lot better—probably up to about 10 meters—though we heard that when it is good here, you can see 30 or more meters under water. The early morning dives were the absolute best conditions: the sun is just rising, the reef is waking up, and the visibility is excellent. Coral system with lots of fishies. Oh, one thing to take note: all dives on this boat were unguided (you have to pay AUD$15 or US$12 for guided dives with DSDD). This was really unusual for us, as we have always been diving with a divemaster, but we came to really like the freedom of unguided diving. DSDD does a little dive brief beforehand to go over the dive area, and then you get thrown into the water. We saw fabulous coral systems, a shark (Jeremy did, I didn’t), a guitar fish, giant clams, rays, turtles, and lots and lots of tropical fish. By far the star of the underwater show, however, was Wally, a giant Napoleon fish who is so tame we were calling him “the puppy dog of the sea.” Seriously, he would swim right up to you and let you pet him and everything. The phrase “diving the Great Barrier Reef” elicits all sorts of fantastic thoughts in the imagination, and though we’re not sure that our experience met these very high expectations, we are really glad we did the trip. We mets many really fabulous people, did our first night dives, logged several more dives in our books, and overall had a really great experience…except for the barf boat. Just about to descend at sunset. ha! the barf boat cracks me up. probably not that funny for you, but makes me think of ’stand by me’. 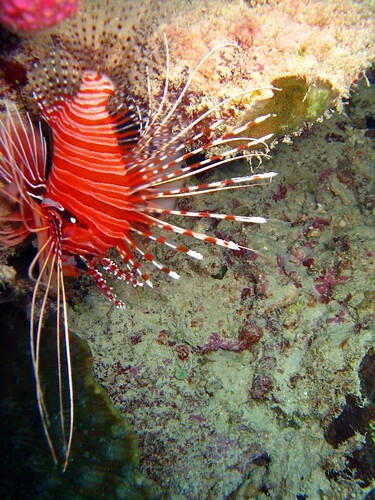 your underwater camera is great and that’s an incredible amount of dives to do over 3 days. must have been nice to have nothing else to do but chill on the boat, sleep and eat since diving tends to wear me out and the accommodations look a lot better than i would have thought. good to know. hey peeps! 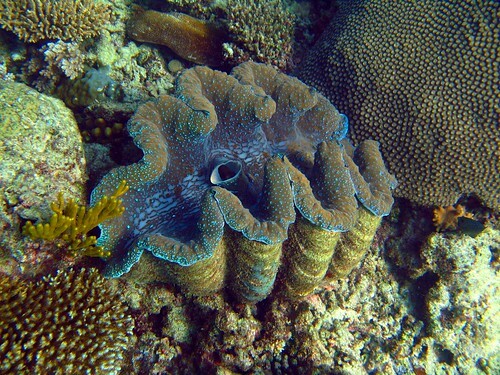 we actually rented the underwater camera from cairns unlimited (http://www.cairnsunlimited.com/cameras.htm). it was a great deal: AUD$75 (approx. US$56) for 3 days, they come to your hotel to drop off and pick up the camera, and then come back the next day with a CD of your images. we were very happy with their service!